Siddhivinayak Temple or Siddhi Vinayak Temple is one of the eight Ashtavinayak Temples of Maharashtra, dedicated to Lord Ganesha. Located on the banks of river Bhima, this Ashta Vinayaka Temple of Ganapati is situated in the remote village of Siddhatek, about 200 km east of Pune, in the Karjat Taluka of Ahmednagar district, Maharashtra. The Siddhivinayaka (Ganesha) enshrined in the Siddhivinayak Temple is said to be the one who is capable of granting Siddhi. It is believed that it was here on the Siddhatek Mountain, that Lord Vishnu acquired Siddhi and as such the idol of Lord Ganesh here is called as Siddhivinayak. The Siddhivinayak Temple at Siddhatek is located on a hill top facing north. It is believed that the original temple was built by Lord Vishnu and a new temple was built during the reign of Peshwa. A Nagarkhana is seen on the main gate. 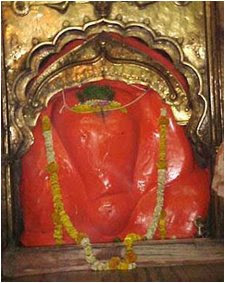 The idol of Siddhivinayak (Siddhi Vinayaka) is swayambhu, with his trunk turned towards the right. This form (with trunk turned to the right) is considered to be the most vibrant form of Lord Ganesh. Placed in a brass frame, the deity is flanked by the idols of Jay and Vijay on both sides. He is enshrined in a sitting posture, with his consorts, Buddhi and Siddhi, sitting on his lap. There is a shivapanchayatan and goddess Shivai’s small temple in the sanctum. Besides, the temple houses the idols of Lord Vishnu and Lord Shiva. Moving towards the Siddhivinayak shrine, there is a place where sage Veda Vyasa had performed yadnya (sacrifices). This place is now covered by water. Legend says that Lord Brahma, with the blessings of Lord Ganesh, was busy in creating the world. While this was going on, Lord Vishnu felt asleep and the two demons, Madhu and Kaitabh, emerged from Vishnu’s ears. They started troubling all gods, goddesses and sages. On realizing that only Lord Vishnu could kill the demons, Brahma and other gods requested him to kill them. Though Lord Vishnu fought for about 5000 years, he failed in defeating the demons. On the advice of Lord Shiva, Vishnu worshipped Lord Ganesh. Vishnu was then successful in killing the demons with the blessings of Lord Ganesha. Hence, the place where Vishnu performed penance and gained Siddhi, is known as Siddhatek and Lord Ganesh, who conferred Siddhis, is known as Siddhivinayaka. The temple opens daily at 4 AM. Saharan Puja is carried out from 4:30 am to 5 am. The deity is offered Khichadi at 10 AM. Panchamriti Puja is performed at 11 am. The Mahabhog is offered at 12:30 pm and the third puja starts after sunset. The Dhooparti is carried out from 8:30 pm to 9:15 pm and the temple is then closed. Celebrations are held during the months of Bhadrapad and Magh, from the Pratipada to Panchami of the waxing period of the moon. In these days, after the Mahapuja and Mahabhog, a procession of the palkhi is carried in the evening from 8 pm. Besides, Bhajans are sung and Dhooparti and Shejarti are held. Siddhivinayak Temple will be visited by thousands of people during the annual Temple festivals of Ganesh Jayanti, Vijayadashami and Somvati Amavasya. Daund Junction Railway Station, which is 18 km away, is the nearest railway station on the Pune - Sholapur line. Mumbai Hyderabad Express, Jhelum Express, Nanded Pune Express, Mumbai Nagercoil Express, Konark Express and Udyan Express passes through Daund Junction Railway Station. Buses are available from Pune and Daund to a village called Shirapur, which is a kilometer away from Siddhatek. From there, one can get on a boat to reach the temple. An alternate route is the long route of 48 km from Daund-Kashti-Pedgoan. In the morning some buses ply from Pune directly to Siddhtek. Pune Lohegaon Airport, around 10 km from Pune, is the nearest airport.